"A Cheaper Way to Navigate Abroad, No Costly Data-Roaming Required", NYT GadgetWise Blog "OffMaps 2 is a well-designed app" 8/10, appstorm.net "This is extremely useful [...] If you are not impressed yet, you should be." 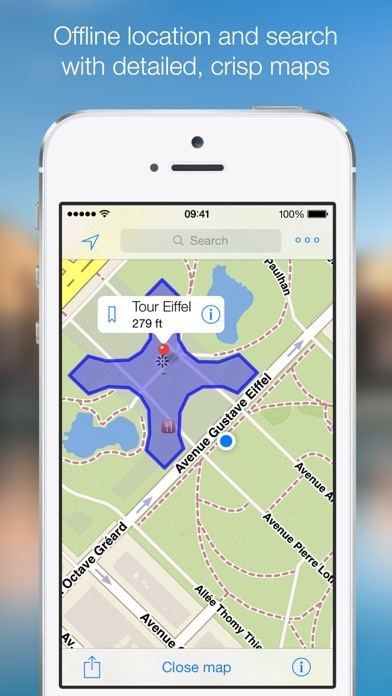 appadvice.com OffMaps 2 allows you to access searchable maps, your position and bookmarks wherever you are, even offline and abroad. 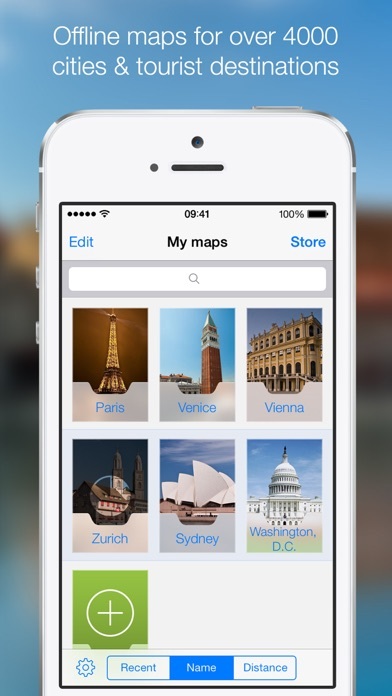 OffMaps stores maps directly on your device and lets you search the map offline. 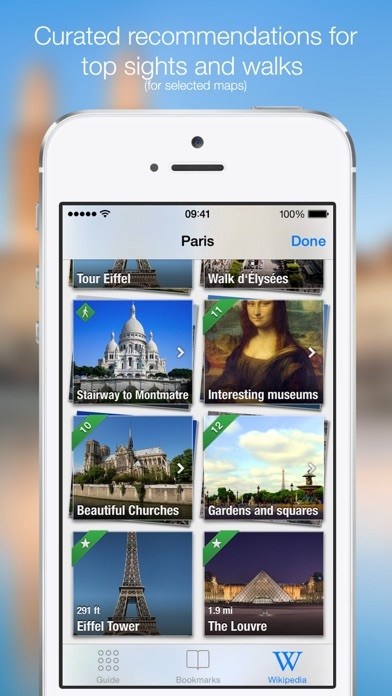 Save data roaming charges abroad with your iPhone or turn your iPod into a fully featured travel guide. 2 maps are included for free, additional maps can be purchased at 0.99$ for 3 downloads (0.33$ per map) or get the lifetime flatrate and load as many maps as you like. Map updates are free. 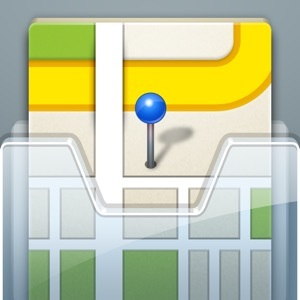 Offline maps with search Maps are rendered on device allowing fast downloads and crisp display. OffMaps uses up-to-date crowd-sourced OpenStreetMap (the Wikipedia of maps) that offer a lot of useful information beyond simple roadmaps from ATMs and bus stops to restaurants and bars. Two maps are included for free, more maps can be purchased from within the app. 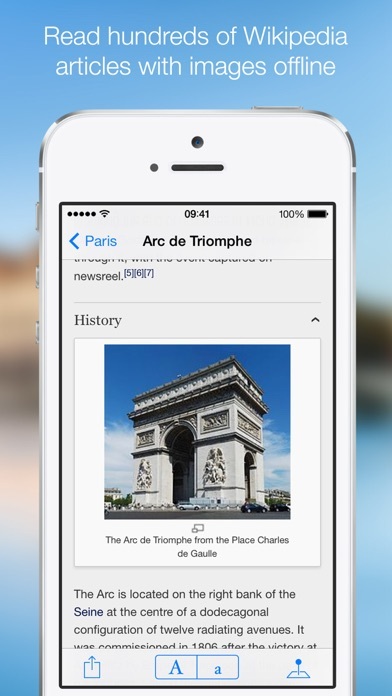 Wikipedia Articles with images offline The ideal travel guide: see wikipedia entries on the map and read everything about the Eiffel Tour, Capitol Hill or Brandenburg Gate. No printed guide offers that information about your destination. 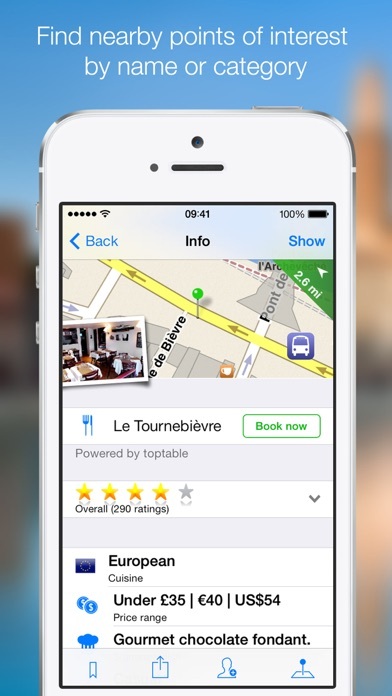 toptable restaurant recommendations Discover restaurant menus and recommendations by toptable - offline - and reserve a table directly from OffMaps. Maps for the USA include: Atlanta, Boston, Chicago, Houston, Miami, New York, San Francisco, Seattle, Washington DC... Maps for thousands of international destinations. A short selection: Australia (Canberrra, Sydney, Melbourne ...), Canada (Quebec, Montreal, Toronto, Vancouver ...), France (Paris, Bordeaux, Marseille, Lyon ...), Germany (Berlin, Hamburg, Heidelberg, Munich ...), Great Britain (London, Birmingham, Manchester, Oxford, Edinburgh ...), Israel (Jerusalem, Tel Aviv...), Italy (Roma, Venice ...), Japan (Tokyo, Osaka, Kyoto ...), Netherlands (Amsterdam, Rotterdam ...), Spain (Barcelona, Bilbao, Madrid ...), Sweden (Stockholm ...), Switzerland (Zurich, Basel ...) OffMaps uses map data from OpenStreetMap (see website). See our website for map quality and availability.